Designed by Henning Larsen Architects and completed in 2005, the Opera House dominates the central harbour in Copenhagen … in part because, obviously, it is a very very large building but the scale is exaggerated by the open areas to either side with lawn to the south - over an area about 140 metres by 140 metres - and on the north side an even larger space 160 metres by 160 metres that is now mostly car park but divided by a dock running back from the harbour and with a historic brick pumping house that dates from the 19th century along with massive gantries of two harbour cranes that were kept when this part of the dock was cleared. The original scheme included large apartment buildings that were to have flanked the Opera House but with the onset of the economic recession that phase of the development was put on hold. New proposals, under discussion, are to proceed with building the apartments planned for the north side of the Opera House around the dock - retaining the cranes and the pump house - but for the area to the south the new plan is to construct a large underground car park and then reinstate the area of grass for a new park with landscaping. 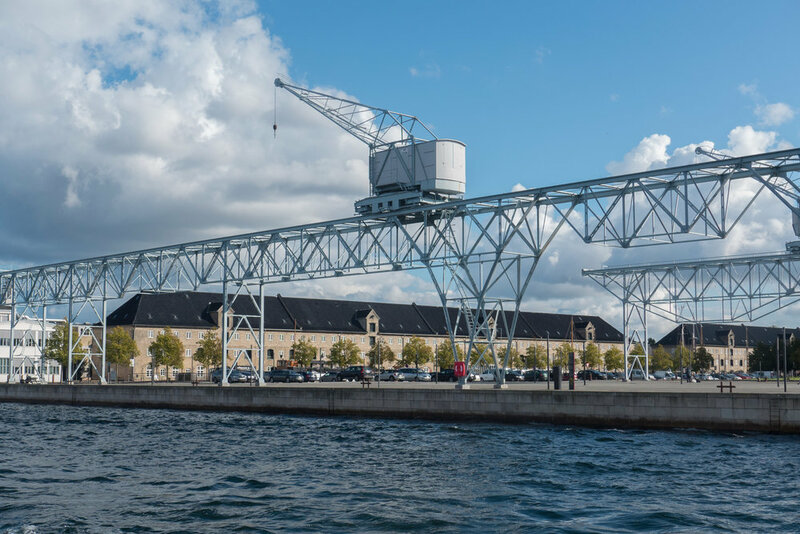 It has been suggested that the quay facing across towards the harbour - facing towards Ofelia Plads but now set back and at an angle - could be pulled forward to line up with the edge of Papirøen to the south. Would that be a gain? It might make the harbour too regular - too much like a wide canal - and there is another potential ‘loss’ because any development and even more dense planting will in part hide and will reduce the visual impact and impressive scale of the two long historic blocks along the canal to the east that were warehouses but are now converted into homes.